Each of the sakes in our Easy Drinking Sake Selection has been specifically chosen for its easy-drinking and smooth-sipping qualities. We’re talking deliciously creamy rice flavours that go well with full-flavoured foods or are perfect just sipping on their own. 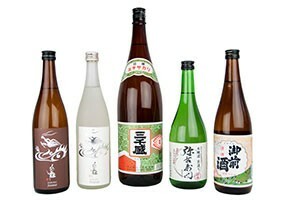 Most of these sake work best at room temperature or above. Evening Sky – a dry and crisp sake from Kimura Shuzo. Think: Mineral, crisp, dry, well-structured. Konishi Silver – A easy drinking Ginjo from Konishi Shuzo. Think: Light, delicate, refreshing; lower alcohol. Signature Brew – a dry Futsushu from Michisakari. Think: rice pudding sprinkled with brown sugar. Superb heated. Autumn Leaves – a full Honjozo from Yamatogawa Shuzo. Think: warming; caramel and creamed rice flavours. Also superb heated. Ancient Mountain – a deep-flavoured Futsushu from Tsuji Honten. Think: warming, rich & creamy. Fantastic over a wide range of temperatures. The Easy Drinking Sake Selection offers a range of eminently quaffable sake that are best enjoyed with friends or loved ones, and pair fantastically with food.